I want to pull into the campground, level, and then be like my cool friends and use a tool to lower the stabilizers and be done. I’m done crawling around on my hands and knees and using car jacks and stacking stabilizers. Dear BF was wonderful enough to get me some scissor jacks for the camper, but they’re too heavy duty and don’t leave enough clearance under my (low) camper. Can anyone suggest ones they like, or things to watch out for? On a related matter I have some heavier duty scissor jacks for sale! $46.99 pr for the stabilizers. This is for a pair and a crank handle. 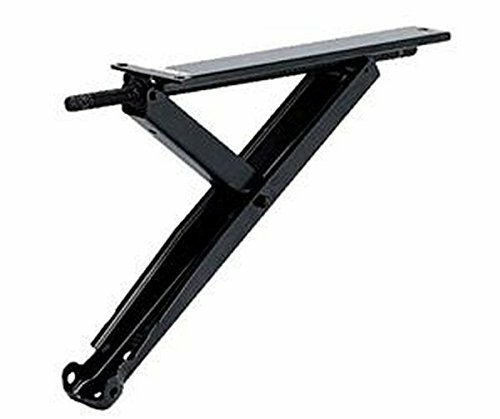 Combine the strength of a leveling jack with the steadiness of a stabilizing jack! New, highly engineered, low profile design is perfect for use with travel trailers and fifth wheels. High strength allows for stabilizing increased loads and fine leveling. Rapid extension provides quick activation of both up and own movements. Integrated foot makes for secure, increased ground contact to prevent slipping or sinking. Features advanced, corrosion-resistant finish for years of dependable use. Boxed set of two 25″. Includes crank handle. Foot pads and telescoping channel sold separately. It was an improvement to go to crank down jacks when we got our second popup, after stack jacks on the first. Even with sand pads on the crank down jacks pictured, we’ve ended up using Lynx blocks under them on many surfaces. It helps prevent sinking on some surfaces, which helps stability too. In one soft site, we lacked blocks for one stab, and it had to be readjusted after a couple of days – we bought more Lynx blocks right after that trip. Also, on sloped sites, we use some Lynx blocks, each stack with a cap, under the stabs to they don’t have to be extended to the max. They are more stable if they’re not cranked out all the way – same with the tongue jack. We started doing that with the popup, and it’s as important with the TT.